In 2008 I got an invitation in the mail to go to a seminar by StoresOnline.com. It was early in the year, and Jackson, TN got one of its usually one or two snowstorms a year. It was right at freezing, the wind was blowing, and there was water as well as snow and ice everywhere. Nonetheless, 45 desperate people showed up, hoping for a way to find an alternate income in the midst of massive job losses. Times were rough. My own home town of Selmer saw the one really large business in town move to a different state. There were several hundred job layoffs in a town of of 4,000 people. Suddenly, my own business, with about 30 employees, was the 2nd or 3rd largest business in the county. I braved the snow and the one-hour drive to Jackson to attend the seminar with my wife. I cannot fault StoresOnline for their presentation. It was smooth and it was persuasive. First they explained, quite accurately, how to achieve success in an online business. The method is pretty cool, and it is used by almost all purely online, medium-sized businesses. Sears, Wal-Mart, and other giant businesses don't need methods. They simply tell their customers at the store and in their commercials that they have an online presence. Boom! Thousands or tens of thousands of visitors per day. The rest of us have no such luxury. For example, I started a free blog just to keep track of a fun thing I'm doing with a baseball game I own. It's a silly game, and I'm not trying to reach anyone. I feel comfortable making a "baseball game journal" out of that blog because I know almost no one will ever find that blog and read it except myself. Research Keywords: Google gets billions of searches per month. I once did research for a midwifery site, and can you imagine that 400,000 people per months search for the phrase "placenta previa"? Another 400,000 search for "mucous plug." A quick search on Google reveals that not too many web sites have articles focusing on either of those subjects. Build Keyword-Focused Pages: If you were doing a web site on midwifery, you would need to write a home page that is just on midwifery and why you built the web site, but you should definitely also write two pages, one called Placenta Previa, and one called "Mucous Plug." Once Google takes notice of your site, you would have 800,000 people every month doing the equivalent of walking by your midwifery office. Presell Your Visitors: How does one presell visitors? It's simple enough. Give them what they want. Give them a good, concise, interesting, accurate and trustworthy explanation of what Placenta Previa is. Make them trust you. Monetize: The next step is obvious enough. You've won the visitor's trust, so now you can recommend services to them. Need a midwife? Here's the one that I, the person who taught you what Placenta Previa is, recommend. That outline is actually a significant improvement on what StoresOnline.com explained. Since they focused on products, not information, they suggested researching keywords that had to do with products rather than keywords that had to do with information people want and are searching for on search engines. Note: If you are still having trouble grasping the idea of a keyword, that means a word or phrase people search for on search engines. Google, Yahoo!, and Bing all keep track of the words their visitors search for. There are tools, some free, that will tell you which terms are the most searched. StoresOnline provided such tools. Only they weren't free. They were charging $39.95/month to sign up for their web sites. In addition, they wanted $4,000 for the lifetime use of their tools! Despite the fact that most of these people were broke—or perhaps because they were broke and desperate—all but three people signed up for their program, all of them financing their dream of entrepreneurial success through StoresOnline.com. I didn't sign up for it, and I talked the man next to me out of it. I showed him that he didn't need to pay $4,000 to search keywords; he could search free at Google's "Keyword Tool." There was another tool that showed what sort of keywords had brought visitors to your website. I showed my neighbor he could get this tool free as well through SEOBook.com. SEO stands for "Search Engine Optimization." It means optimizing your site so it gets found in searches. The salesmen of StoresOnline.com, so professional and charming in their presentation, were furious when I told them I wasn't interested because I could get all those tools for free, which is significantly less than $4,000. They told me I was "stupid" and that anything I tried on my own would fail. I think they knew I talked the person next to me out of signing up. The one big problem with their presentation is that although they had some web sites that they used as examples of success, they were careful to point out that these sites were not necessarily StoresOnline.com sites. They did not have a single success story that they were willing to say, "This happened through StoresOnline.com." They claimed, of course, that was for privacy. You'll see later in this story what nonsense that is. StoresOnline had taught me the method. I had found out with a couple searches that I could use the method for free, so I set out to accomplish that. I had a web site at that time called The Rest of the Old, Old Story. I still do. In 2008, it had been online for several years, and it got about 10 visitors per day. I knew I could improve that with the things I had learned at the seminar, plus a lot of free advice from SEOBook.com (which I still recommend as an excellent site). I spent 4 months reading SEO (Search Engine Optimization) advice books and spending several hundred dollars to get the best ones, I increased the traffic to Old, Old Story from 10 visitors per day to 20. I had added "affiliate advertising," and I had made a grand total of $0.00. Then one day, I came across a web site that claimed to be succeeding. (I've learned since that he is making at least $20,000 per month off his main web site.) He told his story much the way I am telling mine. Mind you, I own a business. My business made it through the 2008 recession, for which I thank God. It sure didn't look like it would. My concern was not money, and I am not earning $20,000 per month off my four SBI web sites. My concern was traffic. I am a Christian, and I feel called by God to teach and to write. In 1990 I wrote a book that was accepted for publication by a small Christian publisher. Only at the last minute did the deal fall through because the owner of the publishing house joined a denomination that would not have liked my book. I was able to pass my book out, in manuscript form, to friends. I was thrilled to reach about 150 people, since the church I was attending only had about 60 members. I considered it a success to get my message out to 150. The SBI web site I found was reaching far more than that. His story was sensational. The owner had his sister do research on the best web site topic, and she came up with kid's birthday parties. That surprised him, but the keywords were great. I don't know how long he has had Coolest Kid Birthday Parties, but I do know that a couple years ago it was getting 100,000 page views per day. SBI was a lot like StoresOnline.com with two very significant differences. The StoresOnline seminar didn't teach us to earn trust with visitors by providing them with information they wanted. They focused on products first and trying to gain visitors by selling products that are often searched for. The problem with their strategy is that it is impossible to compete with Wal-Mart and other large stores on the products they recommended. StoresOnline even had contracts with wholesalers so that their web site owners could by the products at wholesale. Again, though, even at wholesale, the prices were more expensive that Wal-Mart retail! SBI, on the other hand, offered dozens of suggestions on how to "monetize" a web site. We'll talk about those shortly. This is a story, after all, and not an instruction manual. The other significant difference is that SBI didn't charge anything for its tools. They were free. At the time, you could only host a web site with them for a yearly fee: $299, which was affordable for me as a business owner. Now, though, they will let you pay monthly at $29.95. $299/year works out to $25/month. I had once gotten a web site with Microsoft.com that cost that much, and it didn't offer any tools. Most web sites that are free of ads, placed by the host and not yourself, cost $8 to $15. Again, though, none of the tools are added on. What benefit are the tools? Let me tell you what happened to me. There is a whole process that SBI walks you through in picking a web site topic. The instructions are extensive, but imagine if you were starting a business out in the real world? You would need to write a business plan, perhaps find funding, advertise to draw people to your business, etc. SBI was always careful to tell me that this was not a get-rich-quick scheme. Like all businesses, it would take work to succeed, but with work, they would guarantee success. I went step by step through their instructions. Using their tools, and knowing the topic I wanted to write about, I decided on Christian-history.org, which is the web site you are reading this on. My research, with SBI's step-by-step help, showed that this was not a bad idea for a web site, but that monetizing it would be mediocre. If I was after money, it would be better to find a different "site concept." I wasn't after money. I ignored the mediocre predictions of income generation, and I went after readers. On Feb. 10, I got 4 visits from 3 different people. They looked at a total of 9 pages. A week later, I got 9 visitors who looked at 20 pages. I had caught my Old, Old Story site in one week! On Feb. 28, I got 20 visitors who looked at 51 pages. Three months later, in May, I was averaging 71 visits per day and showing 154 pages. One year later, I had my first 1,000 page day, and I was averaging 368 visits every day. I made a little bit of money by running ads on the site, but I soon became uncomfortable with the ads. This was a Christian site, and I was most concerned with spreading a message, and the ads were not helping. SBI and other web site owners on the forum suggested I write a book and sell it on the web site. Being a bit of a perfectionist, I spent an entire year writing that book, and I didn't finish it until May of 2011. Unfortunately, for book sales anyway, I was diagnosed with acute leukemia in June. I was actually pretty excited about the leukemia diagnosis. Talk about building a platform! Everywhere I went after my diagnosis, if I said, "I have leukemia," then everyone else stopped talking. Of course, "everywhere I went after my diagnosis" was not many places. I was in the hospital getting my first dose of chemotherapy three weeks after my diagnosis. I had to get a blood transfusion to make it to the hospital. Recent visit to hematologist oncologist; Still alive and in remission! 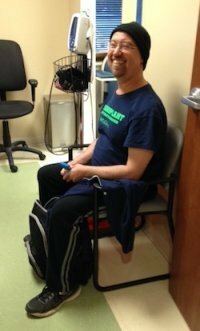 Between the chances of being put into remission by the chemo, the chances of being killed by the treatment, and the chances of relapsing, my odds of surviving back in July of 2011 were about 20%. I didn't worry about that. I'm a Christian. I don't believe cancer can kill me. Only God can kill me. If a year of chemotherapy, radiation, and a bone marrow transplant were in my future, then great. I tackled leukemia treatment the way I would tackle mountain climbing. This would be an adventure—a painful one, to be sure, but an adventure. I never lost focus on that, so I'm sure my next book, Yippee! I Have Leukemia! will be better than my first one. At the time of my diagnosis, Christian-history.org was averaging 800 visitors a day. Think of it. In 1991 I was thrilled that 150 people had read my first book. In 2011, more than 5 times that many people were reading the things I wrote every day. During the time I was writing my book, before the leukemia diagnosis, I realized that Christian-history.org was not ever going to make any significant amount of money. That didn't matter to me, since I made enough money from my business, but something else did. My business is a warehouse business. Our employees are close to one another, and morale stays very high. Still, I wouldn't want to work in a warehouse all my life. I hatched a plan for my employees. I would ask them to work for me for at least five years. After that, if they could come up with ideas for their own business, I would do anything I could to help them get started. I bought subscriptions to a couple of helpful magazines, especially Entrepreneur. However, I knew that I had a way to start a small business that I had never really put enough effort into. I did keyword research on another topic that I am familiar with: evolution. I'm not just familiar with it, but I really enjoy science. After some research, I determined that I could do a web site on evolution where I could be less concerned about the type of ads appearing on the site, and I could make money with it. For those of you that know anything about the rocky relationship between Christians and evolution, it may seem odd that I would have a web site on Christian history and one called "Proof of Evolution." In fact, I became convinced of the evidence for evolution back in 1994. It caused me a lot of trouble at that time, but my fellow church members have all gotten settled with it since. Once again, I had no problems getting traffic. By the summer of 2011, when I went into the hospital, the site was showing 500 pages per day. Monetization, however, was not a success. The site paid for itself, earning more than the $300/year I was paying for it, but not much more. Once again, I had not made the best choice for a web site. I knew one other topic that would be nice to try. I left proof-of-evolution.com up and running because it made enough to pay for itself and because I get letters on and off from people who tell me how much it helps them. I quit working on it, though, and I moved on to my next attempt at internet success. I started Revolutionary-War.net before leukemia, but it really hadn't gotten going before I went in the hospital. On the day I was diagnosed, it got 148 visits, and I wouldn't look at again for months. Still, 148 visits in a day were much better than the 15-20 that I was getting at OldOldStory.org which I had tried to optimize without SBI. My daughter and my daughter-in-law are history buffs, however. I hired my daughter-in-law to do assistant work at my warehouse, but also to write pages for Revolutionary-War.net. While I was in the hospital, Revolutionary-War.net took off on its own. 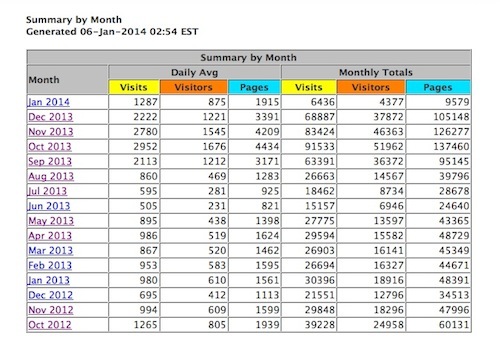 Without any work, it climbed to an average of 869 pages per day when I got out of the hospital in May, 2012. It kept climbing, and when I hired my daughter-in-law six months later, it was 1,600 pages per day from 600 unique visitors every day. Then Esther started writing pages. She loves history. At first I was alarmed at the amount of research she put into the pages, but the results were so good I didn't say anything. Good thing. Google made some changes to their algorithm in early 2013 that hurt all my web sites. Revolutionary-War.net hung on, maintaining its traffic through May. History sites like ours are frequented by students. As a result, we have drastic drops in traffic on the weekend and during the summer. As a result, we held our breath for three months while Esther kept writing pages. September came, students went back to school, and we waited to see what would happen. September: 1200 unique visitors per day and 3,000 pages. October: 1676 unique visitors per day and 4,434 pages. November: 1545 unique visitors per day and 4,209 pages. Income climbed just as traffic did. It's now at $750 per month, just for that one site. Christian-history.org has 400 pages or so, over 100 of which are just quote pages I've been slowly accumulating. Quote pages take very little time. Christian history, however, is a passion for me, and I would write about it whether I had a web site or not. Revolutionary-War.net has 145 pages. Each page represents about 4 hours of work, though some have taken much more, and others much less. That's 580 hours of writing for the web site. If someone were to devote an average of one hour per day for a year and a half, they could match that output on a subject they are passionate and knowledgeable about. The return on those 580 hours is $750/month that continues whether we work on the site or not. The value of those hours increases with every month that passes. If you need a secondary income, I advise you to do what others have done. Become most concerned about what sort of web site will make you the most money. If that were my concern, I would have made a midwifery site already. Not only could a person run "contextual ads" on such a site, but one could refer midwives to visitors and collect a percentage of the feel from the midwives. I've suggested this to a couple friends knowledgeable about the subject, but they don't seem to have the desire or the time. I have seen a wildly successful site on kids' birthday parties. I have seen another wildly successful site on "Do-It-Yourself Construction Projects." A soccer site I know of makes at least $3,000/month, and the entrepreneur who did the site worked so hard at it that he achieved this in a year. All of these are SBI sites. I know of several full-time-income sites on travel that are done through SBI. One very successful site is on debt management. I met the owner of that site, and though I don't know her income, it is better than full-time. Unlike StoresOnline did with me, SBI doesn't leave their sites anonymous. They post their results (see chart to left). 65% of their sites are in the top 3% of internet sites in web traffic. 35% are in the top 1%. Individual case studies are available and abound. That's my story. I believe SBI is worth the effort. There is one more thing to tell you about if you're still interested in reading my story. One of the most difficult parts of SEO optimization is using the appropriate amount of keywords on your pages and in the right places. Even more difficult is the work of submitting each page to Google, Bing, and Yahoo! (the engines responsible for about 95% of searches). SBI does all that for me, which I'm sure is why my SBI sites are so much more successful than my other sites. I'm not worn out with making sure I didn't miss any notifications to Google, and I don't have to do searches to see where I stand. SBI keeps a list for me of all my pages, their current status with all the major engines, and where they appear in searches for key terms. Another SBI tool checks every one of my pages when it goes up and let me knows if I should make adjustments to my title, meta tags, and the density of my keywords. Of course, I write my own html and upload it. You don't have to. SBI provides one of the best page builders in the industry. They claim it's the very best, but since I've only used it once or twice, I can't vouch for that. I can vouch for the fact that it's easy to use. I can also vouch for the fact that it prepares your site for advertising, makes it easy to make sitewide changes, and prepares your site for code that you'll understand once you go through their preparation training. I've read more than one SBIer that has talked about SBI "holding your hand" through the entire process of setting up not just a web site, but a web business. I would use the same terminology. I once checked on a Dave Ramsey week-long seminar, and I found out it would cost around $3500. Dave Ramsey teaches on financial planning and responsibility, but I decided it wouldn't be fiscally responsible to go to a $3500 seminar! I've been to a couple Solo Build It seminars, and they were very inexpensive. My favorite one was a drive to Charleston, SC. I'm pretty sure the whole weekend seminar, with two nights in the hotel, a cruise in the bay, and dinner on the boat, cost $500. My wife and I had a blast, and of course, there was opportunity not just to learn about how to build an online business, but opportunities to talk with successful web site owners and get specific advice for our own situation. I've really enjoyed the two seminars I've been, too, though Dallas wasn't nearly as nice as Charleston. The seminar was just as helpful and just as inexpensive, though. Okay, that's my whole story. You can get more information on Solo Build It below. Real case studies (hundreds, I think) on success cases. Solo Build It's summary of the free tools I've been describing.